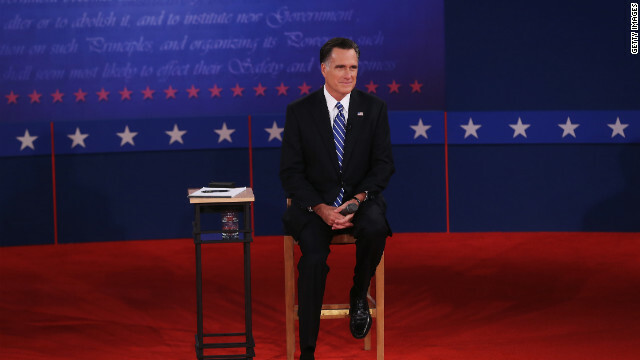 (CNN) - After a day dominated by Mitt Romney's "binders full of women" comment from the second presidential debate, the GOP presidential nominee defended himself against the tsunami of social media swipes and blatant jabs at Romney's expense. "I understand the challenges women face and want to make it easier for them in the workplace," Romney wrote on Twitter Wednesday afternoon. In his tweet, he also pointed to a video featuring women he worked with in the Massachusetts state government during his time as governor. One woman described him as "very, very sensitive" to women's issues in the workforce. Ellen Roy Herzfelder, identified as a former Romney cabinet member, said "he totally gets working women, especially women, like myself, who had two young kids." Also Wednesday, Kerry Healey, who served as Romney's lieutenant governor in Massachusetts, highlighted his background in hiring women. In an email to supporters, Healey said of the top 20 positions in the Romney administration, 10 were filled by women, including his chief of staff. "Governor Romney wasn't just checking a box. He sought out our counsel, and he listened to our advice. We didn't always agree, but we were always respected," Healey wrote in the email. Responding to a question about pay equality in Tuesday night's debate, Romney told a story about putting together his cabinet as governor. He said at the time he questioned his staff for recommending only male applicants. "I went to a number of women's groups and said, 'Can you help us find folks,' and they brought us whole binders full of women," Romney said on the debate stage in Hempstead, New York. The 'binders full of women' phrase quickly went viral, sparking internet memes as well as attack lines on the campaign trail. Both President Barack Obama and Vice President Joe Biden mocked Romney for the line at separate events. At his own campaign event in Virginia, however, Romney sought to argue that he's best equipped to help women get back to work. "This president has failed America's women," Romney told the audience. "As I go across the country and ask women what can I do to help, what they speak about day in and day out is help me find a good job, or a good job for my spouse. And help my kid, make sure my children have a bright future, better schools and better job opportunities." "That's what the women of America are concerned about and the answers are coming from us and not from Barack Obama," Romney said. - CNN’s Rachel Streitfeld and Dana Davidsen contributed to this report. The "binders full of women" attack on Romney is zero substance, and is only the same childish mocking that is ALL the Obama people can seem to muster. Does anybody think there is anything of significance to this mild word fumble by Romney? It would be like saying Obama really thinks there are 56 states in the USA. I am astonished at the media partisanship that allows this lame point to make front page, or any page. This childish Obama campaign approach – make fun of your opponent – is rejected by regular people, and is why Obama will lose. If I need to hire a woman, instead of reading her resume I will look at a binder full of women. This term sounds familiar. Anyone who makes fun over this comment has a probem with women. Women should realize that it is Obama that has a problem with women. He threw his mother, grandmother, Michelle, and now Hillary (2 times) under the bus with no problem. OBAMA IS COLD TO WOMEN. If Democrats actually had something to run on or defend, then Big Bird and Binders wouldn't be a topic of discussion. Democrat voters I would be really upset with my party leaders about now, they are really dumbing down issues for you. Do you need that? I think next time I apply for a job, I will send in my binder instead of a resume. Maybe I will land the job on the first inter-view instead of having to go through two or three interviews. I could even decorate my binder to draw attention to myself, to make a better impression first impression. My wife does not fit in a binder. Maybe that's why she is a Democrat. Make it "easier" for women... How 'bout just make it "fair" – equal pay for equal work. I don't want special consideration, I just want to be paid the same as the men. And why should I be allowed to leave early to "be with my children" if you don't allow the men who have children the same? Romney did not answer the question he was asked on equal pay for women. He only gave answers that he hired women, said nothing about the pay. It's amazing to me how people form their all knowing opinions based on what they read and their own bias. Most of these opinions are rationalizations to support their position. Both candidates have misspoken and oh how the media and twitter loyalists jump on it. All Romney had to add was the word candidates(which is what I think he meant) after women and there would be no flap at all. Instead the comment is used to denigrate the candidate and allow people to show how all knowing they are. Romney you missed the point of it again. We don't care if you are nice to work for! I'm sure you are a very nice man. The problem is that you don't seem to think women are equal. Your comments prove that again. Yes, we want a bright future for our kids and husbands, but we want it for too. Romney may have goofed with his statement towards women but he is a genuine persons who cares for women and everyone. He has shown this by his actions and not words. The one of many problems with obama is that he is in office. He keeps telling people what we should do, but, he is in office right now. If these plans are soo important, then why hasn't he been pushing hard to get them implemented. For example immigration reform, he promised in his first year to have that done. Instead he pushed obamacare for the past 4 years. He said he would cut the deficit in half, he has doubled it. He promised the most open and transparent administration, but, has blocked records from being seen; he has invoked executive privelage. He promised to ban assault rifles, instead his administration has been handing them out to criminals that used them to murder people. He promised to heal and unite the country, instead he pits rich against poor, black vs white, latino vs white, and then goes out with his rich white friends and gets more campaign money. He promised laser focus on jobs, instead he golfed and tells us to get an education. Again, this is sound byte over substance. Yes, Romney was silly for using such a phrase in this day and age. Anything beyond "blah blah blah" gets seized upon and manipulated to no end. But it is equally silly to disregard what he was trying to say- when he saw too many male candidates for his cabinet, he sought out women'g groups for help, and they showed him that there were many qualified female candidates. I just read a fact check on Romney's claim that he initiated an effort to find qualified women. The claim is FALSE. A group call MassGAP had already solicited resumes of qualified women and had delivered them to both candidates prior to the election. So in all his years in business he did not know any women that were qualified to be in his cabinet? How many women were in top positions at Bain? Anyone who watched the debate undestands what the "binders full of women" comment meant. All Romney was saying was that he wanted to include more women in his cabinet and was given a binder full of women's resumes. This action should be applauded, not ridiculed. Those who are misrepresenting his intent are shameless and attempting to mislead. These type of attacks often backfire, as I expect they will on November 6th. The American electorate as a whole is not so ignorant as to not question the state-run-media and Progressive's motives. Yes a vote for Mitts means all housewives will be home to cook dinner for their spouses ! Romney will publish a Government binder of acceptable meals that all wives can adhere to. So now he has binders full of women, AND videos of them? Way to neutralize the situation, Mittens. Is this the Dems have got? "binders full of women"? Helloo, major corporations pride themselves on diversity issues allowing working mothers to have flexibility in their schedules to tend to their families as wives and mothers. Oh right, forgive me thats the AMERICAN way with family values present. The Dems only have those values when its convenient. Especially wit a president thats not an american, how would he know? You go Mitt. The only way Romney would get my vote is if he promises me a binder full of women. But Then again, Romney doesn't follow through on his promises. Do you wat to believe these stories?????? Tell you children–not USA. Still employed woman at equal pay unlike the current president. Romney's remark about the need to "accommodate women" in the workplace was a remarkable statement reflecting his attitude about women in general. His example of a woman who needed to get home at five to feed the children (and perhaps her husband?) shows how unthinking he truly is. Why is it that the man does not have to go home and feed the children and perhaps his wife? Think about it. It is all about what he thinks about women and their role in the world. He thinks a woman's role is to support their man. Hello 1945.